So happy to be here at The Peak of Tres Chic again. This is Albertina from Mimosa Lane back again for our third installment of the "We Love" series where Sam and I swap posts for the day. 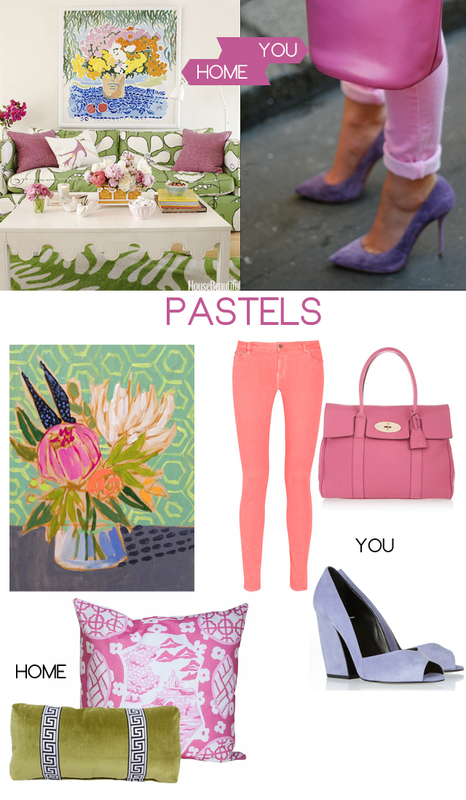 Today Sam and I are focusing on the pastel color palette for you and your home- The ideal colors for Spring! Nothing says Spring like flowers and what easier way to incorporate flowers into your home than in art! And these Lulie Wallace paintings are very affordable and add so much brightness and color to a room. And pillows are just the easiest way to freshen up any corner. These are both from Society Social which in my mind is equivalent to happy and beautiful. And now talking about outfits- I would have never thought of mixing purple and different shades of pink. My daughter would have thought of this (Of course! She is 5), but not me and this is why this photo really struck me. I loved it. Such a beautiful, soft look. I actually have some pink jeans and a shirt with purple stripes so I will be trying a version of this look. Feel free to make it your own! These are just some fun ideas to make you see things you may already have in a different way. What colors are you wearing lately or adding to your home? Come visit me at Mimosa Lane so see what pastel photos are inspiring Sam. Loving that pink pillow! And I think I need to buy me some colored pumps asap. Loving those purple heels so much! Great picks. SO happy and perfect for spring. Great color choices! And of course these shoes ... Yes I'm a shoes addict and I love them colorful!!! I'd love to have such a refreshing palette in my home right about now! Totally dying over all of these pastel and minty hues!